I promised to show you how to make my Christmas banner. I will admit it was very easy and very inexpensive (cheap). While shopping at Walgreen a couple of weeks ago for some new ornaments to finish decorating the Christmas tree I found these darling wooden, rustic and woody ornaments for $1.00 dollar each. and I was done...The red cardinal and the reindeer with a red star spells Christmas to me. I bought a couple more ornaments and I will show you how I used them soon. Thanks for visiting and please come back soon. Hi Betty, These ornaments are just darling, and I LOVE your pretty Christmas banner!! Simple yes, but I doubt I would have thought of this -- very creative of you. :) Your whole mantel looks beautiful; I love the greenery and the mercury glass trees. It all looks very festive and welcoming. Thanks for sharing this with us and have a wonderful weekend! 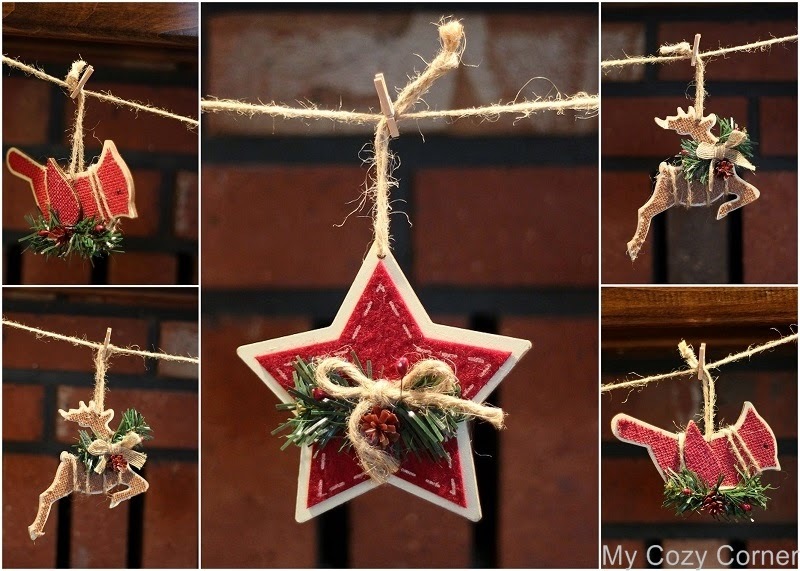 Love the idea of ornaments hanging on a line. Very creative and joyful. Great idea. I love the cute ornaments and your banner. What a great idea.. Thanks for sharing..Merry Christmas to you and your family! Your Christmas banner is wonderful. How clever of you. I love those ornaments and they look great by your fireplace. Merry Christmas! Your mantle is pretty and the banner looks adorable strung in front of it. Thanks for linking to Mosaic Monday. They are as cute as can be! Makes me want to run to the drugstore! Have a wonderful week! Merry Christmas!!! Lovely mantle decorations. Wonderful idea!!! Wishing you the Merriest of Christmases!! Those are sooo cute! I may have to run to Walgreens. Would you believe we're putting up another tree, at this late date? I'm wanting a rustic woodsy theme, and your ornaments would be perfect. Thanks for the idea. Merry Christmas! I love this banner and have seen a few ideas that I must try next year. Too cute! I love the "nature" look. What a good find at Walgreen's and great idea.